Trail of the Ark considers that there could be hostile forces against finding the Ark of the Covenant. This possibility relates to on-going attempts to disinvest the Jewish Nation from associating with its heritage. There is one location that plays a significant role on the Trail of the Ark. Due to perceived volatile conditions on the Temple Mount, the Trail of the Ark introduces a military style information gathering system. Students of history and religion alike are generally aware of the historic and religious bond between the Ark of the Covenant and the Temple Mount, where it rested in the holiest of places. The Trail of the Ark project constantly revisits the scene of this essential part of the Ark’s history. However, like other religious motivated or archaeologically driven explorations associated with the Temple Mount, it faces serious real time challenges. The first enormous challenge represents a serious threat, due to the strong religious association with the Temple Mount for conflicting faiths. Passion is a strong emotional outlet that often becomes divorced from the source of its outflow. Let me explain. The very mention of the place known by Jews as Har haBayit, by Muslims as Haram al-Sharif, and by its general English name as the Temple Mount can stir up powerful forces within those that find a meaningful purpose behind its location. This force can in turn unleash a passionate response, which can trigger off any number of physical acts, depending upon its context. There is one prime example to demonstrate the type of context that can spark a dangerous conflagration. Israeli Prime Minister Ariel Sharon once took a simple walk on the Temple Mount. Like a scene from the Forrest Gump movie, countless others responded to that leisurely stroll by an elderly man, in the most violent of ways. For arguments sake, let’s say that it was a premeditated act. It would then have been calculated to trigger a response where hoards of angry Muslims would go on a rampage, with many ensuing deaths from both Arab and Jew, which was the effect of that walk. In that prospective scenario, it clearly proves that instigating a passionate response is of itself a powerful weapon. Such an act can then better be known as instigating a riot. Does historical fact confirm that intent? The beginnings of the Second Intifada, although claimed by Arabs to have been provoked by Sharon’s stroll, was later proved to have been prepared by Palestinians, well before, that famous incident. That clearly demonstrates how the Temple Mount, of itself, can arouse such acts of unbridled passion in the first place. The answer is simple. This one location lies at the core of all monotheistic belief systems, and to stir the brew is to make an explosive concoction. However, it would be erroneous to point a finger in the general direct of Muslims worldwide. In searching for the truth, it is essential to be guided by quiet wisdom rather than the beating of an enraged heart. Even a good soldier on the battlefield knows that a well-aimed weapon is no match for one that wavers in all directions. ‘The Final Stage’ by David Lev, was originally entitled ‘Hidden secrets of the Foundation Stone’ Its changed name reflects how events on the Foundation Stone, located on the Temple Mount, can trigger off “The Final Stage.” ‘The Final Stage’ provides a plausible explanation as to just how much of the current political volatility came into being from dubious sources. The question today, is how to correct common misconceptions that continue to wreck havoc on those most susceptible to violent acts based on blind passion alone. This work includes exploring the early roots of Muslim conquest in Jerusalem. It demonstrates how much of a chasm exists today between the thoughts and actions of a few of those earlier leaders, including those with pious intent, in comparison with what may be better described as a revisionist Islamic movement. And it is this latter day extremism that instigates the most concern for those embarking upon the trail, hoping that only truth will prevail and lead to desirable finds. In stark contrast, to the science of archaeology, it is regrettable that certain Muslim authorities appear to be burying history rather than uncover it. In July 2007, the Wakf engaged an uneducated approach towards apparently repairing a power outage on the Temple Mount. Even if one accepted their excuse for employing heavy earth moving equipment to lay a deep trench, in an area claimed to be rich in history, than one cannot avoid the conviction that they would also have buried their own alleged connection with this holiest of sites.But their focus was more on trying to disprove others claims to an historic link with the mount, instead of aiming to prove their own suggested heritage. 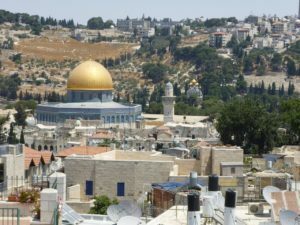 A case in example would be the casual dismissal of an accredited Israeli archaeologist, Gabi Barkay, who’s team found solid evidence of ancient Jewish presence on the Temple Mount, while sifting through the dirt that the Wakf themselves had removed from the site. Aside from accusing Barkay of only coming up with finds that were not unearthed directly on the mount, their chief archaeologist, Natseh went further, He commented that “Barkay has leapt to unwarranted conclusions in order to strengthen the Israeli argument that Jewish ties to the Temple Mount are older and stronger than those of the Palestinians. This is all to serve his politics and his agenda,” Natsheh says. Yet all things considered, that abrasive dismissal of one of Israel’s greatest archaeologists can be likened to the proverbial shot in the foot. Surely, if the Wakf were so confident about their own historical ties to the Temple Mount, wouldn’t they have also wished to show the world uncovered evidence pointing to that fact? In carelessly disposing of potential evidence, and undermining those that preferred to preserve finds from the deep, they only really succeeded in weakening their own argument about their ties being stronger than Jewish ones? Returning to the hidden secrets uncovered in the Final Stage, there is certain sadness about the Wakf approach to historical issues. They seemingly do have a fair claim deserving of some credit, but it is mainly due to their ancestors respect for the Jewish association with the site, and far from the prevailing attitude that exists today. Why is this issue of consequential importance on the Trail of the Ark? Whilst embarking on a journey of in-depth discovery, it is pertinent to realise that there are opposing forces on the trail. If it can be clearly demonstrated that the Wakf, the Muslim authority in charge of Muslim holy sites, is deliberately aiming to disinvest the Jewish nation of its heritage, then further discoveries on the trail might also be vulnerable to forces seeking their own agenda, to the detriment of what might be considered as a truth that can be uncovered deep within the area surrounding the Temple Mount. To venture along the trail with a balanced approach to discriminating fact from fiction, the Trail of the Ark will introduce a military style process for sifting through the vast realm of information gathered on the trail. By utilising an Intelligence Cycle, one can also suggest that serious consideration is being given to treating the Trail of the Ark as a potential political and religious battleground, which accordingly requires a sound military style information management and security system.